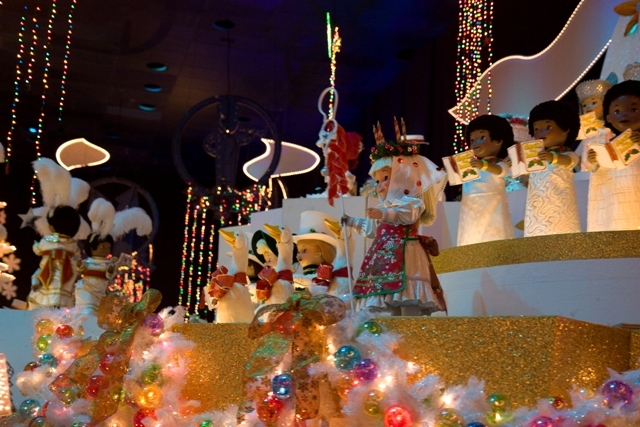 So I’m not sure what the official name of the Small World Holiday ride is, but let’s just go with that. 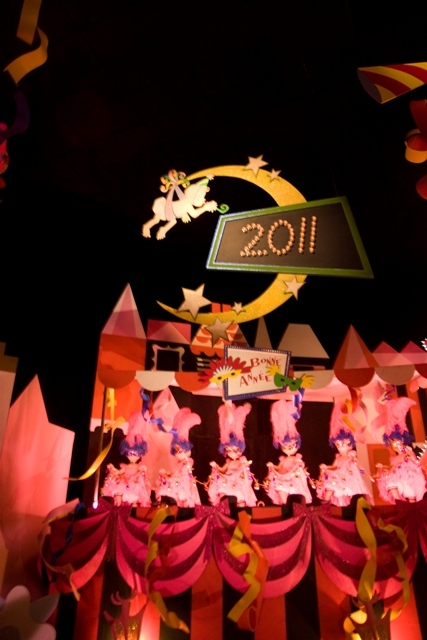 It’s A Small World is a classic Disneyland ride. 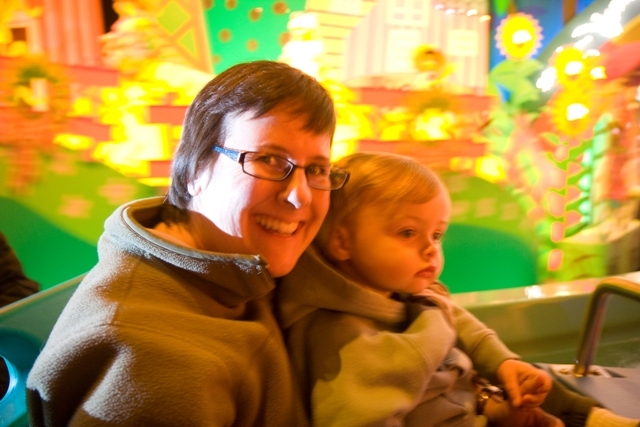 I can remember, as a child, loving Small World above all else. Dumbo too, but the Dumbo line is soooooo sloooooow. 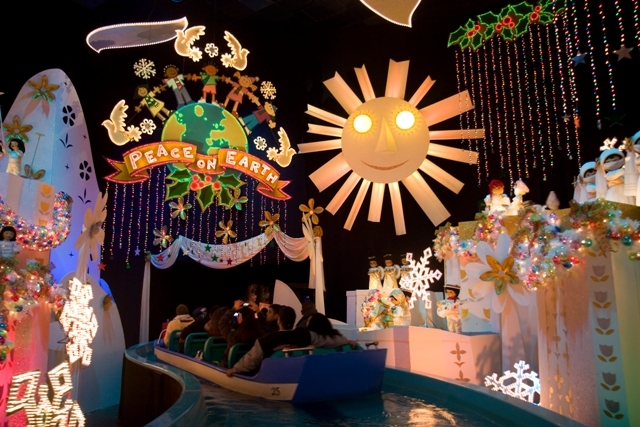 Anyway, yeah, Small World gets a bad rap because of the annoying song (I bet you’re singing it now–am I right? ), but honestly it’s a really great ride. A couple of years ago they revamped the whole thing, primarily because the average guest weighs more than they did when the ride opened in 1966. I’m not just being bitchy here. It was a real problem. The ride was designed with boats floating in a trough, carried along by nothing but the current of the water. As the guests got heavier, the boats sank further, and the current alone had a harder time moving the boats along. Seriously, your boat would kind of get stuck. And while it was a rather humorous bonding experience to be reaching out with the other guests and pulling yourself along the concrete walls, it was definitely Not A Disney Experience. I mean the only time you should be doing that kind of thing is on the Explorer Canoes. So they shut the whole thing down, and while they were busy on the trough, they revamped the dolls as well. 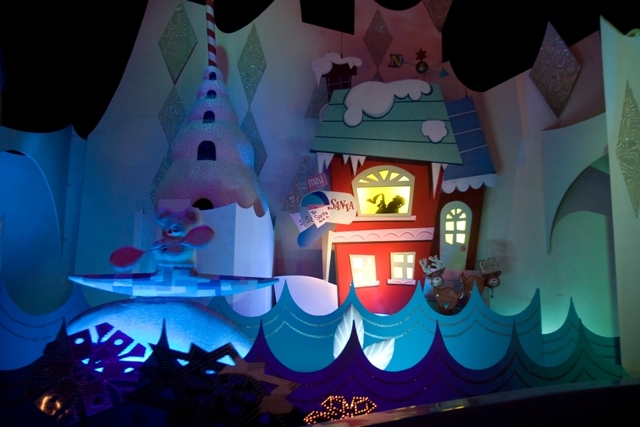 The New and Improved Small World featured two major changes: 1) more bouyant boats with a track to help them along when necessary, and 2) Disney characters added to the scenes. #1 seems self-explanatory. If you’re familiar with the “Little Tikes” brand of children’s toys, the boats are like riding in a Little Tikes boat. For #2, I was concerned this could go very, very badly, but they actually did a great job. It was things like subtley adding Ariel to the mermaid scene, or Aladdin and Jasmine flying overhead in the Persian scene. Tastefully done. 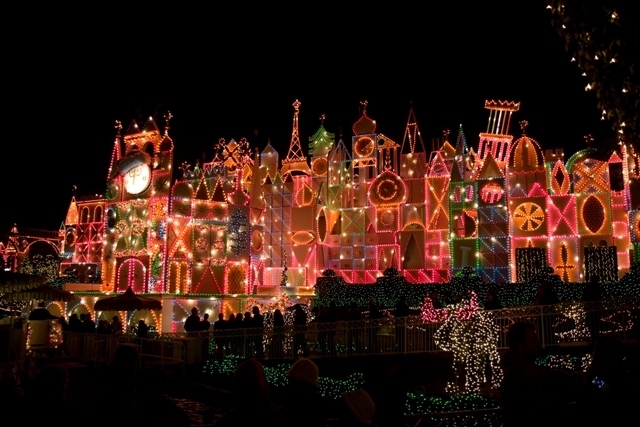 ANYway, so when it comes to holiday time, Disney completely transforms Small World into the Holiday Small World Extravaganza! (please say this with an Italian accent, and that’s not the actual name) They basically re-do every scene to turn into a holiday related theme. And not just Christmas, because Disney is all about Inclusiveness. 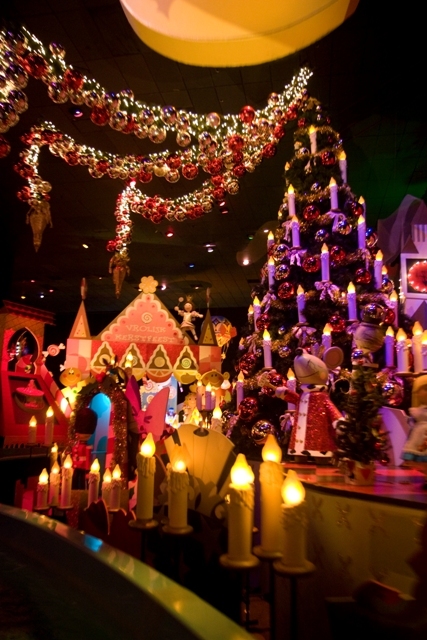 Additionally, if you hate the Small World song, here’s your chance–it’s now a medley of Small World, Jingle Bells, and Deck the Halls (which if you’re a pagan, you cannot possibly get more pagan than Deck the Halls). The outside also looks great. The clock face is wearing a Santa hat! No, seriously--it's wearing a Santa hat. 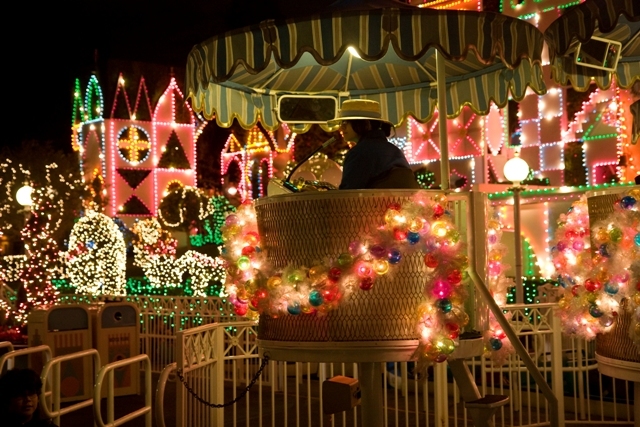 Approaching the loading station, you see one of many strings of lights and bulbs. I’m fairly certain these garlands are directly from the 60’s, because the cellophane look is absolutely something I’ve seen in pictures from the era. Check it out--Santa is in the Eskimo scene! Candles! And a Christmas tree with candles! And candles! Can Can Can you ring in the new year? I'M NOT THE ONLY ONE WHO TAKES BLURRY PICTURES!!! Okay, really. 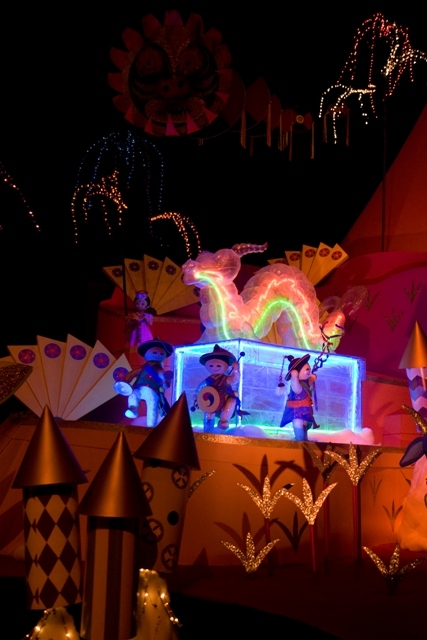 Chinese New Year happens in like February, but I’m not going to fault Disney for being multicultural. Peace On Earth--I can TOTALLY get behind that. And also behind the Little Tikes boat in front of us. 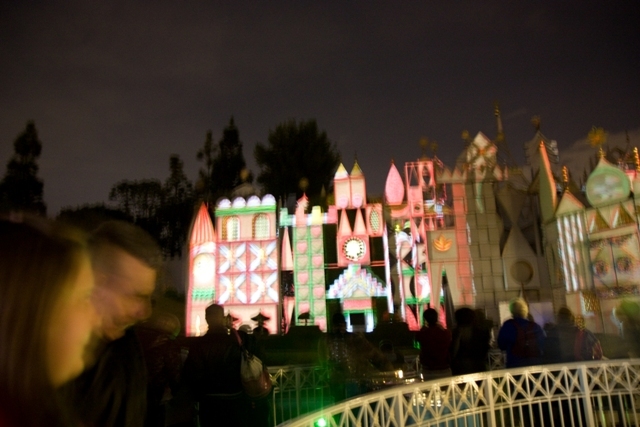 Also, Holiday Small World does this thingie on the outside that I call the “Psychedelic Nutcracker.” It’s kind of hard to describe, but every 15 minutes or so they show this film thing with flashing and colored lights and the facade lights up at different coordinated times and basically the kind of thing you don’t want to be looking at if you’re prone to seizures, and it’s to music, where one of the prominent songs is from the Nutcracker. Here is yet another example of my stellar photography skills. So basically that’s it. 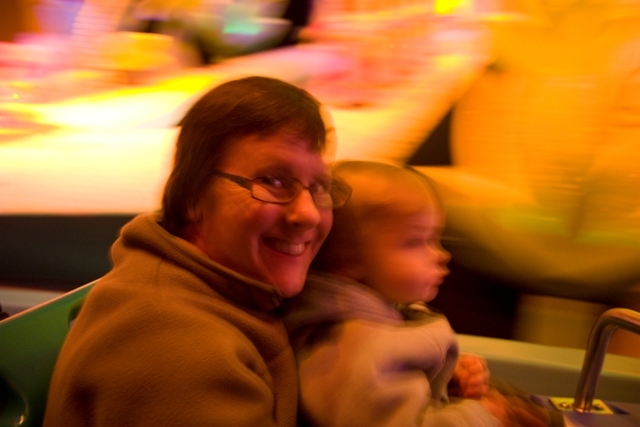 Holiday Small World. Don’t miss it.